V. A. Chistyakov, Y. V. Denisenko (2012) Cellularity loss and the Dilman’s problem: in silico research, Biochemistry 77, 936 - 951. This deterioration results from glands cellularity loss. The experiments in silico carried out with the help of model prove that the phenomenon of loss of sensitivity to hormonal signals with the subsequent stop of cycles can be imitated in the elementary modelling system, and in the basis of the given phenomenon, as well as in the basis of the majority of gerontological phenomena, cellularity loss can lie. The experiments in silico show that, in principle, the diversity of hormonal effects that accompany the realization of the phenoptosis of multicellular organisms can be provided with a simple Уsoftware mechanismФ This mechanism based on the gradual loss of cellularity as a result of continuous run of apoptosis in some cells of the glands due to natural fluctuations in levels of intracellular inducers of apoptosis. The main practical sense of our work lies in the illustration of the fact that substances inhibiting cellularity loss can theoretically be effective suppressors of hormonal changes characteristic for aging. The analogy of concepts "phenoptosis " and "apoptosis" includes not only surface similarity of processes designated by them. Natural decrease in the number of cells forming postmitotic tissues of a multicellular organism, is usually УusedФ by the nature for maintenance of gradual decrease in adaptable abilities of aging forms. Apoptosis as set of programs of cellular suicide is the convenient tool for realization of higher level phenoptosis program. A number of facts confirming this thesis have been accumulated by now. However, complexity and diversity of the aging process extremely complicate the logic analysis, allowing to organize these facts into a system. In our opinion, mathematical modelling, especially in the form of creating imitating models can be a convenient auxiliary means in this case. Multiagent modeling allows to form in silico a number of the independent objects interacting among themselves and with the medium according to the rules set by the researcher. The point of mathematical methods application consists in achieving reproduction in silico of "external" manifestations of aging by means of the simplest "internal mechanism" [1, 2]. Such mechanism will apparently be the most essential engine of aging. Naturally, modeling of the Уinternal mechanismФ should be based on the biological facts, at least not to contradict them. the program of cellular death is started as a result of casual level fluctuations of the corresponding stimulus, capable to start the mechanism of programmed cellular death. The model created by us allows to see how decreases the number of cells in which generation of apoptosis signals takes place, distinctions of intensity of these signals submit to the normal law. The death of a part of cells is initiated after excess of the level of apoptosis signal, similar for all cells. Even such primitive model has allowed to put forward explanations of some experimental facts connected to research of the new generation antioxidant (SkQ1). In paper  the aging model of Drosophila melanogaster - one of the most popular objects of experimental gerontology ( was described by us. The model is based on the same principles, as the ones described in paper . The survival of individuals generated by the program depends on the part of the motoneurons remaining. Experiments in silico, carried out using it allow to generate survivor curves, similar to the curves obtained in experiments with real insects. Thus, by synthesis of ideas about cellularity loss as the aging basis, about programmed cellular death, and also taking into account free-radical aging theories it was possible to develop the elementary mechanism simulating important elements of aging phenomenology. Aging modeling of the drosophila is facilitated by the fact that it is a postmitotic short-lived organism. Aging of such forms is the simplest and the most obvious example of phenoptosis and apoptosis interface. Aging of more complex and long-lived animals is caused by complicated changes of hormonal regulation. It is accompanied by failures of such fundamental cycles as sleep-wake cycle, estrous and menstrual cycles etc. At the same time various phenomena are observed - from failure of hormonal cycles to age increase of certain hormones concentration with the subsequent dramatic decrease of their production. The beginning and the termination of hormonal cycles define the beginning and the termination of postnatal ontogenesis stages. 4) Eventually, sensitivity decreases so that it leads to pathological consequences (normal illnesses of aging). Most clearly "the cybernetic component" of DilmanТs ideas are stated in the popular scientific book . Probably, therefore they were not taken seriously enough by experts in the area of aging modeling, and biologists and physicians have concentrated on search of experimental proofs of existence of the mechanisms predicted by Dilman. At the same time it is clear by intuition that to resolve the contradiction formulated in item 1) and 2) it is possible not only involving the additional mechanism described in item 3). We have assumed that long trends of hormones concentration growth can be a consequence of functioning deterioration of glands producing inhibitors of their synthesis, that develops as the result of their (glands) cellularity loss. The purpose of this paper is development of a model, allowing to simulate age changes of hormonal cycles on the basis of our assumption. There are several glands consisting of postmitotic cells. The quantity of a hormone produced by a gland depends on the number of cells. In a simple case when there are two glands, the hormone produced by the first gland activates the second gland, and the hormone produced by the second gland, inactivates the first gland. This minimum system with negative feedback leads to formation of cyclic fluctuations of concentrations of both hormones. If the number of the cells forming the second gland, drops under a certain level, then in response to the hormone of the first gland the signal terminating its functioning ceases to be generated. Actually it is loss of sensitivity to hormonal signals. Using a system of three glands allows to make behavior of the system more varied without changing its basic laws. From the cybernetic viewpoint the model is a system with negative feedback when the output signal is sent to the input and under certain conditions suppresses the input signal, coordinating the system condition in such a way. In the model the system of three or two glands operated with feedback, is scrutinized, taking into account induced by internal signals apoptosis and stochastic character of some proceeding processes. The structure of three glands model is shown in fig. 1. At the launch of the model each gland is formed as set of independent agents (cells). Each agent possesses a set of parameters, individual for different glands. Gland A produces for each cell in a time unit (cycle) a certain quantity of hormone A, the production of which is subject to the normal law with the set parameters. 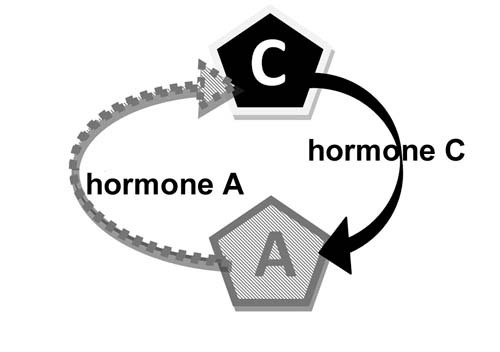 In each cycle a part of hormone is degraded. 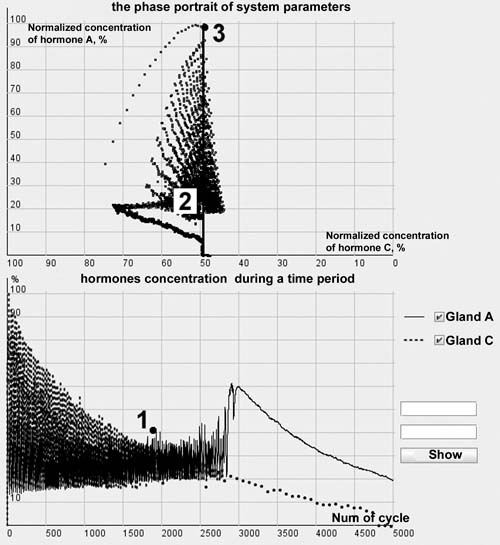 When (and if) the quantity of hormone A reaches the set threshold value, gland B is activated. It functions similarly to gland A. When hormone B reaches its threshold value gland C is activated. It also functions like glands A and B. 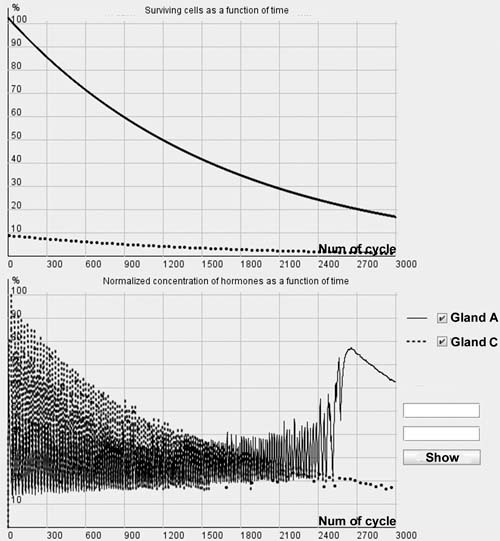 Excess of threshold value by quantity of hormone C causes a pause in the functioning of gland A. The process of hormone production we see as quasistationary, when distribution time of production speed changes is much less than characteristic times in system of glands. Cells of glands are mortal, and they die according to the laws stated in article . 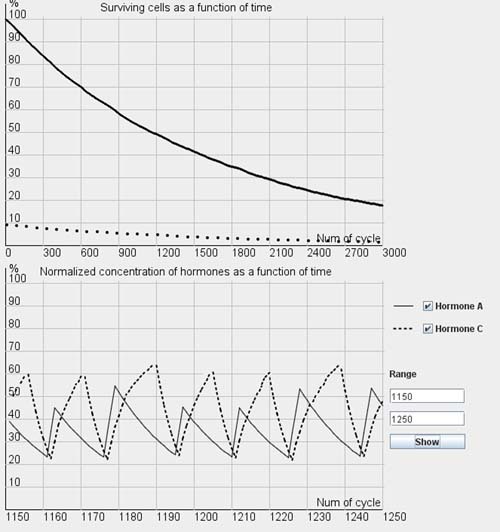 As the investigated value relation of hormones concentration in the medium to the period (of the cycle) is considered. In the process of scrutinizing the model of glands interaction it is of great interest to reveal the distribution laws of hormones concentration during a time period, to compare distribution of hormones concentration taking into account cellularity loss and not doing it, and also to reveal features of imitating model behavior. It should be pointed out that due to to the stochastic setting of some model parameters, the discussion given below has substantially qualitative character. The cellularity loss scheme put forward in the model also has a probabilistic nature. Therefore it is possible to judge quality indicators, but their quantitative values will vary from experiment to experiment. Moreover, as it is shown below, change of some values calculated in the model displays the behavior, characteristic for catastrophe points, when a minor change of one parameter changes the system behavior both quantitatively and qualitatively . The behavior of systems with two and three glands was investigated. Not taking into account cellularity loss, the distribution picture of hormones concentration during a time period is quite simple (fig. 4). In fig. 4, a distribution of cell quantity in each gland during a time period (for non-aging glands – the dotted line parallel to the axis of time) is shown, in fig. 4, b – the distribution of concentrations that is periodic functions with shift of phases is shown. The cellularity loss was taken into account with the help of methods developed earlier [1, 2]. As fig. 5 shows, in case of taking into account cellularity loss the picture is more complex, the distribution curves amplitude of concentration changes during the time period and as more detailed consideration shows, the period of these curves also changes in time. As experiments in silico showed, the behavior of two glands system is qualitatively similar to behavior of three glands system (fig. 6), however, the effects in two glands system are more expressed. Further the model of two glands system will be considered. As it can be seen in fig. 6, in the system of two glands losing cellularity united by the mechanism of negative feedback, there can be a distinct trend of increase in concentration of one of the hormones (in this case of hormone A). In fig. 7, b (scaled up), it is possible to observe the peaks form variations of dependence curves of hormones concentration during a time period which are present only in the system with cellularity loss. 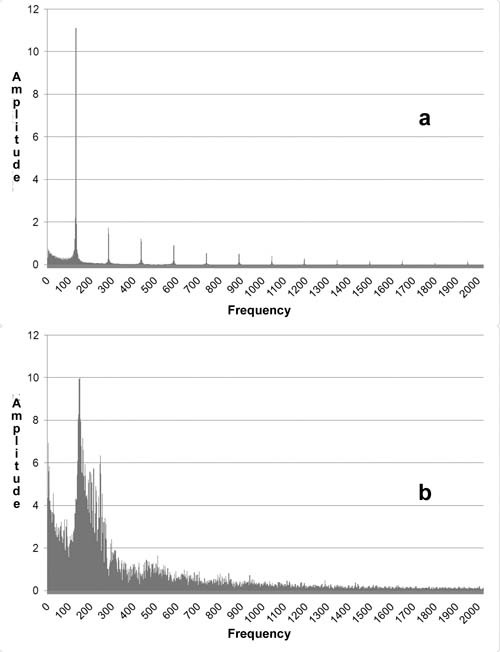 With the aim of revealing distribution laws of hormones concentration during a time period their frequency analysis (fig. 8) was carried out. During consideration of glands model taking into account cellularity loss it is possible to point out three sections of a curve in fig. 8 quite accurately: – the periodic frequency-modulated signal to the left of point 1, chaotic (at least visually) between points 1 and 2, and monotonously descending to the right of point 2. Fig. 8. 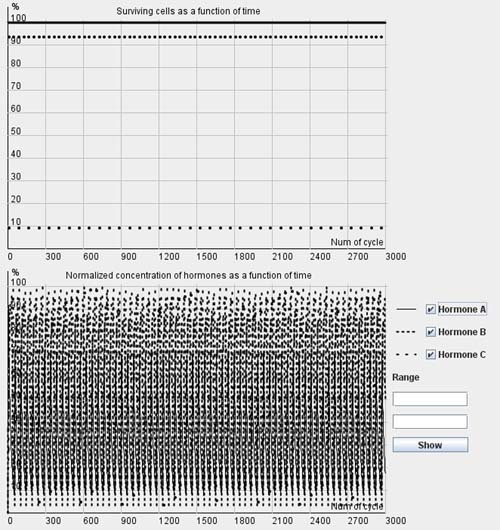 Dynamics of fluctuations frequency of hormones concentration. Minor fluctuations of concentration after a stop of a hormonal cycle have stochastic character. In addition it is necessary to take into account the fact that during model calculations only relative and (or) standardized values are used, therefore it is necessary to deal with absolute values of any output parameters carefully. However it should be pointed out that, as well as in live systems, at typical short duration of 20-25 cycles period (the time units used in model; for example, one cycle can be equal to one day) duration of the transition period from periodic dependence to a monotonous phase is quite long and takes ~ 500 cycles. These numbers come from the individual set of the initial model data (though can fluctuate in different experiments). It can be seen that on the periodic segment roughly before cycle 2250 frequencies of hormones A and C fluctuations completely coincide, so their frequency characteristics overlap. 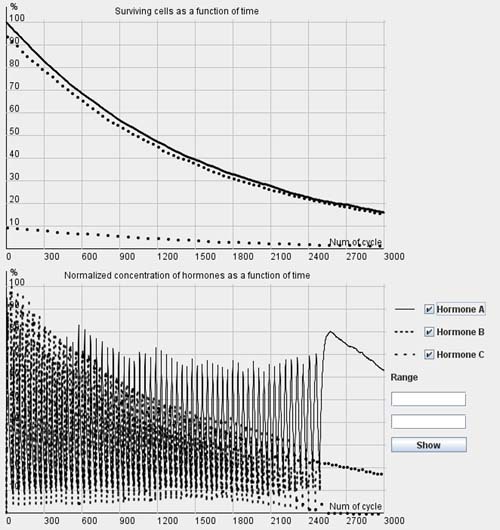 Then, over a period of 500 cycles the curve of fluctuations frequency change of hormone A concentration becomes asynchronous to the curve of hormone C (fig. 8) After that both curves get a monotonous descending character. It is worth mentioning that asynchronization of hormonal cycles with the subsequent hormone production decline is one of typical manifestations of aging. For further investigation of model behavior an attempt was taken to apply the Fourier analysis . It should be stressed that the classical kind of it is not quite suitable for studying non-stationary processes as it is able to reflect only frequency characteristics of a signal. However, for revealing the general characteristics of this system Fourier analysis application seems to be reasonable. Below is the picture of temporal representation decomposition in frequency space for distribution curves of standardized values of hormones concentration in the interaction models of two glands without (a) and with (b) the account of cellularity loss (fig. 9). In calculations the algorithm of fast transformation of Fourier was used. Due to the standardization of the obtained values noted above the signal form is interesting for us, but not its quantitative indicators. From the displayed amplitude-frequency characteristic (AFC) it is possible to make the conclusion that taking into account cellularity loss account introduces a great number of additional frequency components into the signal. While the signal shown in fig. 9(a) consists of the basic low-frequency signal and several minor high-frequency signals with much smaller amplitude, a signal in fig. 9(b) contains a considerably greater number of frequency components. Hence from the viewpoint of frequency characteristics the curve of hormones concentration change taking into account cellularity loss consists of considerably greater number of components. At the same time this complexity does not result from the model stochastic character. The model of glands interaction not taking into account cellularity loss also has the stochastic character, however its AFC has a small number of frequency components. It can also be claimed that AFC concentration of A and C hormones have a similar but not an identical view. In other words, aging of the system forming the hormonal cycles allows to obtain additional information about controlling the system behavior parameters that are supervised by genes in real systems. Thus, the frequency analysis of in silico experiments results provided an absolutely unexpected acknowledgement of the reality of the ideology taken by V.P.Skulachev as the basis of his mental experiment "with silly and clever hares" . Unfortunately, the classical Fourier transformation does not allow to draw a conclusions about temporal characteristics of a signal which also can possess some peculiarities. For their investigation it is necessary to address its frequency-temporal signal representation. Wavelet transformations refer to this group . 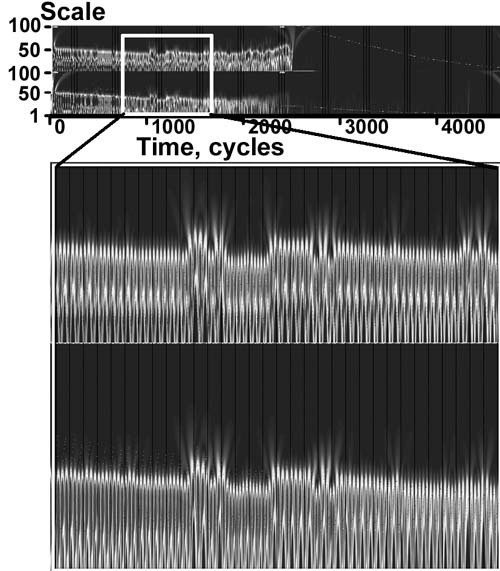 The analysis task in this case is rather simple: it is necessary to take two data sets and to display their wavelet-spectrograms visually. If visual comparison reveals some peculiarities, their deeper analysis is carried out. First of all the wavelet-analysis of the results of two glands model functioning without taking into account cellularity loss was carried out. Wavelet-transformation parameters were selected taking into account the requirements of revealing distinctions in data sets. In this case pictures of wavelet-transformations (fig. 10) for the hormone A (above) and the hormone C (below) are similar. Besides, there are no noticeable temporal changes along the horizontal axis. As a matter of fact, after the Fourier-analysis it is an expected result. Then the wavelet plane was constructed for the signal taking into account cellularity loss (fig. 11). A part of the plane is cut out and enlarged for vizualization. It should be pointed out that visually the behavior peculiarities of hormones concentration curves change synchronously. 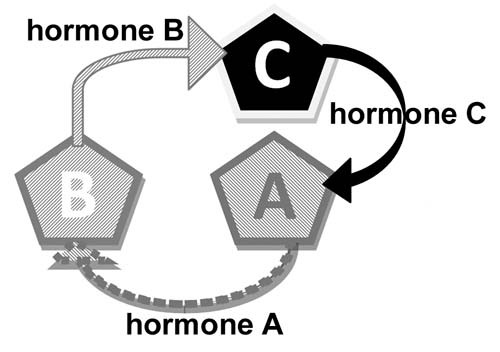 As a whole the picture for the B hormone replicates the picture for the hormone A. At the same time the picture in its first half is similar to a picture of periodic process (though we know about its frequency modulation (fig. 9). The transitive segment where the pictures differ sharply is an exception. For clarification of the question about the origin of such distinctions, and also as a whole about the origins of nonstationarity, a model without stochastic elements was designed. At certain standard basic values the stochastic model of cellularity loss in the specified initial conditions was approximated with an exponent. 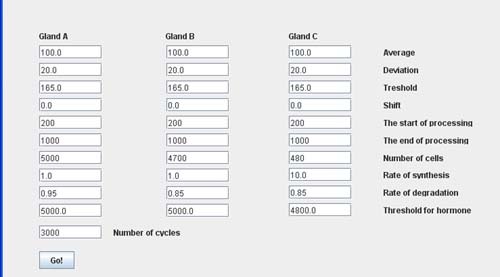 where: t is the cycle number; NA(t), NC(t) is the number of cells in the respective gland during a cycle under t number. Fig. 12. Effects of the hormone level increase, failure and cycle stop in the system of two glands losing cellularity. The model without stochastic elements. Obviously, the source of changes is cellularity loss. At the same time rather slow decrease of cells number in glands causes a considerable qualitative change of hormones concentration distribution. Let us draw the phase portrait  of system parameters changes with "standardized concentration of A hormone" – "standardized concentration of B hormone" location. In fig. 13 both the phase portrait, and the hormones concentration – time curve are represented . Within the periodic segment (to the left of point 1 in fig. 13,b) the phase curve converges to point 2 (fig. 13,) along a concentric trajectory. To the right of point 1 phase curve loses the regular character. The regular character of the phase curve allows to make some assumptions based on its start about its further development. 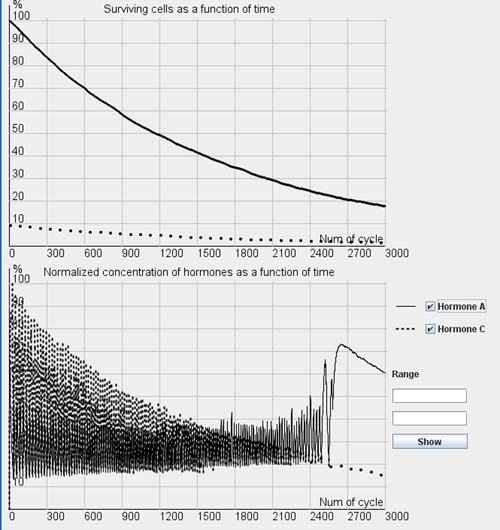 For example, after 4000 cycles hormone C concentration becomes equal to 0. It is easy to identify the A hormone concentration corresponding to this point, having set the abscissa of point 3 at the very beginning of phase portrait formation. Obviously, such concentration of hormone A corresponds to the threshold value for inactivating gland B. If the assumption about catastrophic (in mathematical sense) character of loss of hormones production regularity with cellularity loss proves to be true, it will be possible to put forward the question of looking for Уaccident flagsФ (the events warning about the approach of a critical point) and to understand, whether the pessimistic phrase of the founder of the catastrophe theory Rene Thom: "Perhaps, it will be possible to prove inevitability of some catastrophes, for example of illnesses or death" is true . However, using our model, it is easy to show that catastrophic scenarios in development of hormonal cycles are connected to cellularity loss in glands that can in principle be УinactivatedФ at the expense of introduction of apoptosis signals generation inhibitors like SkQ or at the expense of changing the expression of small number of genes. The model of cellularity loss in a homogeneous cells population developed by us earlier can be used for imitation of function decline processes in a gland, cells of which produce a hormone regularly during its life. Decrease in cells number causes a decrease in hormone production with relevant physiological consequences. However, the principles of glands functioning are much more complicated. Many glands directly or mediately influence functioning of each other, forming hormonal cycles. The phenomenon of glands sensitivity loss to signals of other glands is of great interest from the viewpoint of aging modeling. It leads to failures in functioning of hormonal cycles important for aging. According to the elevation theory created by V.M.Dilman first of all for solving the problems of practical gerontology, the key moment of aging is hypothalamus sensitivity loss to hormonal signals what causes a stop of adjustable hypophysial-hypothalamic system of hormonal cycles . The correctness of this theory was confirmed with a number of observations though carrying out the correct experiments unambiguously confirming validity of hypotheses is extremely complicated in gerontology. The model created by us undoubtedly doesn't allow to substitute calculations for biological experiments. Nevertheless the experiments in silico carried out with its help prove that the phenomenon of sensitivity loss to hormonal signals with the subsequent stop of cycles can be simulated in the elementary in silico system, and that cellularity loss can lie in the basis of this phenomenon, as well in the basis of the majority of gerontological phenomena. As it can be seen in fig. 5, cyclic character of hormone A production stops roughly after 2500th temporal cycle. Synthesis of a hormone A intensifies. Thus gland A loses sensitivity to inhibiting hormone B influence, mediated by gland C which loses cellularity to a critical value up to this moment. The developed model also allows to imitate irregularities of hormonal cycles characteristic for aging animals. (fig. 6, 8). Hormonal changes play an important role in regulation of animal ontogenesis. Genetic control of mammals ontogenesis, at least in the postnatal phase, is mediated basically by changes of hormonal cycles. This idea is realized in the model created by us. Varying a small number of parameters (fig. 3), in real live systems determined with the expression of genes, controlling the level of apoptosis signals, a threshold of cells leaving into apoptosis, speed of synthesis and disintegration of hormones, we can model such phenomena important for the aging process, as regular changes of amplitude and frequency of fluctuations of hormones concentration, the failures of hormonal cycles and their termination connected to the age, and also age-related increase of some hormones concentration, which is connected to the inhibiting gland degradation. The models developed by us show that basically the whole diversity of hormonal effects accompanying realization of multicellular organisms phenoptosis, can be provided with a rather simple program mechanism. This mechanism is based on gradual cellularity loss as a result of systematic apoptosis start in a part of gland cells due to natural stochastic level fluctuations of endocellular apoptosis signals inductors. The main practical value of our work is the illustration of the fact that the substances inhibiting cellularity loss can theoretically be effective supressors of hormonal changes characteristic for aging. This work is completed with the financial support of the Institute of Mitoengineering of Moscow State University, the Ministry of Education and Science of the Russian Federation, the Federal Target Program grant УScientific and pedagogic personnel of innovative Russia (state contract є 14.740.11.0006) and the Ministry of Health and Social Development of the Russian Federation. 1. Chistyakov V.A., Denisenko Y.V. (2009) Russian Journal of Chemisty. (The Journal of Russian Chemical D. I. Mendeleev Society), 53, 105-110. 2. Chistyakov V.A., Denisenko Y.V. (2010) Advances in Gerontology, 23, 557-563. 3. Szilard, L. (1959) Proc. Nat. Acad. Sci. USA, 45, 30-45. 4. Dilman V.M. (1982) Big Biological Clock (introduction into integral medicine), Znanie, Moscow. 5. Arnold V.I. (1990) Catastrophe Theory. Nauka. Moscow. 6. Makarova N.V., Trofimets V.Y. (2002) Statistics in Excel, Finance and Statistics, Moscow. 7. Skulachev V.P. (2007) Biochemistry, 72, 1572-1586. 8. Astafieva N.M. (1996) Advances in Physical Sciences, 166, 1146-1170. 9. Chulichkov A.I. (2003) Mathematical models of non-linear dynamics, Fizmatlit, Moscow. 10. Anisimov V.N. (2003) Molecular and physiologic mechanisms of aging, Nauka, SPb.